Autobytel® has named the spacious Kia Sedona the 2015 Van/Minivan of the Year! The aggressive, yet refined Kia Sedona is the ideal getaway vehicle. From the spacious driver cockpit, to the versatile Slide-N-Stow™ seats, it might be mistaken for the perfect place to hang out even when it’s not on the move. The 2015 Sedona provides comfort and convenience for everyone and high-tech gear to keep you connected. Stop by and check out a 2015 Kia Sedona at Carriage Kia today! The 2015 Kia Sedona operates on a strong 3.3L DOHC 24-valve V6 engine generating 276 horsepower and 248 lb-ft of torque. Enjoy a quiet, smooth ride while achieving up to 24 mpg highway and 18 mpg city*. The 2015 Sedona has incredible standard exterior features including: body-color mirrors with LED turn signal indicators, body-color exterior door handles, solar controlled front windshield glass, heated rear glass with timer, variable intermittent windshield wipers, a rear wiper/washer, projector beam headlights, rear spoiler, a locking fuel filler door, and 17-inch alloy wheels. Higher trim levels have more outstanding available features to choose from such as power folding outside mirrors, heated outside mirrors, a Smart Power Liftgate, a Height Adjustable Liftgate, front fog lights, roof rails and larger wheels. Discover the perfect look for your new Kia Sedona in one of the many available trims. The 2015 Kia Sedona has a premium interior to keep you comfortable and connected! 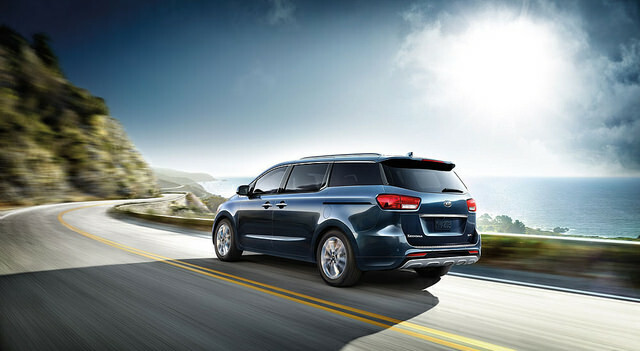 The 2015 Kia Sedona comes standard with convenient interior features including: AM/FM/CD/MP3/SiriusXM Satellite audio system with 4 speakers, USB/auxiliary input jack, steering wheel-mounted audio, hands-free phone, and cruise control buttons, Bluetooth® Wireless Technology Hands-Free Connectivity, backup warning system, remote keyless entry Active ECO System, air conditioning, trip computer, Tricot Fabric Seats with YES Essentials® Fabric Treatment, and Slide-N-Stow™ 2nd-Row Seats. Find available features on the higher trim levels such as 4 speakers with dash-mounted tweeters, Infinity® Surround Sound Audio System with External Amplifier, Center Channel & Subwoofer Speakers, HD Radio™, rear camera display, 3.5″ Meter Cluster with Organic Light Emitting Diode (OLED) Display, drive mode select, leather heated and ventilated front seats, and a leather wrapped heated steering wheel. 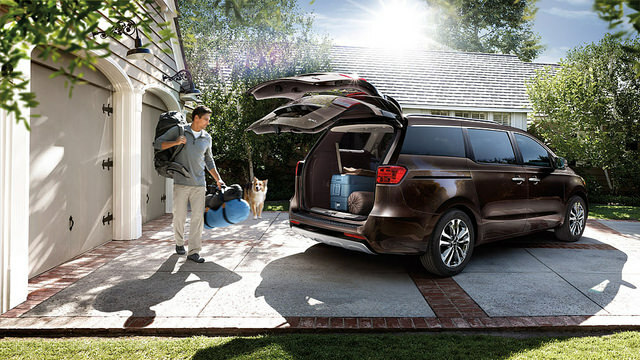 There is something everyone in your family will love about the 2015 Kia Sedona! Some of the standard safety features on the 2015 Kia Sedona include: dual front advanced airbags, dual front seat-mounted side airbags, full-length side curtain airbags, Rollover Mitigation (ROM), 3-point seat belts for all seating positions, front seat-belt pretensioners, Electronic Stability Control (ESC), Traction Control System (TCS), 4-wheel disc brakes w/ Antilock Braking System (ABS), Cornering Brake Control (CBC), Electronic Brake-force Distribution (EBD), Hill start Assist Control (HAC), Tire-Pressure Monitoring System (TPMS), side-impact door beams, front and rear crumple zones, Lower Anchors and Tethers for CHildren (LATCH), and rear child-safety door locks. 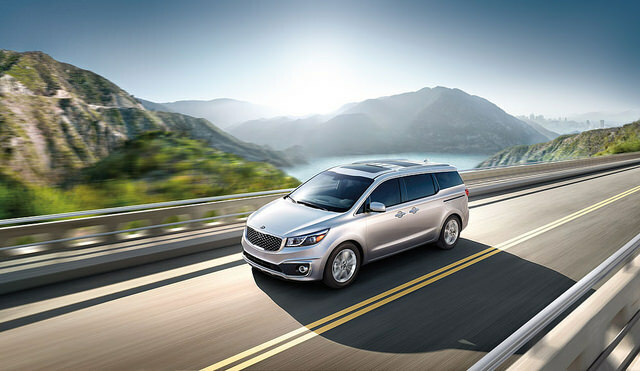 Be sure to stop into Carriage Kia and experience the perfect family vehicle in a 2015 Kia Sedona today! With our large inventory, our team here at Carriage Kia loves helping our customers find the perfect new car or used car for them! Please feel free to contact us if you have any questions or would like to schedule a test drive!